Direct from the southernmost region of the Brazilian high plains comes a centuries-old way of cooking, where the rodizio found its roots around the campfires of the traditional gaucho. 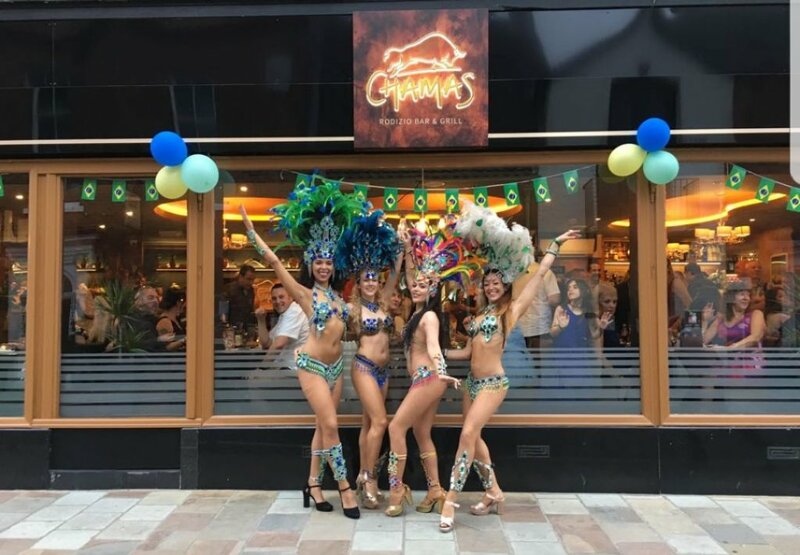 A continual service of large skewers of meat including beef, pork, lamb and chicken were spit-roasted over the famous churrasco barbecues and passed from man to man to enjoy. 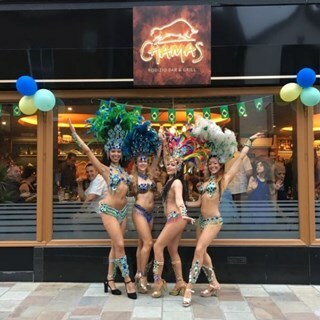 At Chamas, we have kept this feast and festivity tradition alive and offer an unlimited continual table-side service of up to 15 delicious prime cut meats alongside our freshly prepared gourmet salad bar, all for a fixed price. All our products are locally sourced from the finest suppliers and only the highest quality ingredients are used. We warmly invite you to experience an authentic taste of Brazil’s food, the wine and most importantly, the passion of the people. Had a wonderful first visit to Chamas having been recommended by a colleague at work. This won’t be the only time we visit as we enjoyed every second of our time there. The Manager explained the concept as we sat down and the staff were very happy to help and made sure to ask whether there were any meats we particularly liked to bring more round for us. Nothing was too much for them. The selection on the salad bar was also fantastic and had allergens listed too which I thought was a nice touch for those with dietary restrictions. Overall thoroughly enjoyed our meal and will be quick to return and to recommend! Excellent food and service. More expensive than your average lunch - but this is no average lunch. This was the first time me and m partner have been and we loved it. I thought it was that good i have recommended it to a few people i work with who like good food. Fantastic as always. Staff so helpful and friendly especially with the children. Amazing food. Nothing beats it. Lovely place, atmosphere, food and very attentive and passionate staff. 5 star service and will definitely be returning! Very good atmosphere,  really well stocked salad bar. One small criticism would be that the meats come too quickly. Perhaps that is our fault because we don’t use the beer mats properly? Food was lovely but I was slightly disappointed that I had booked online and had informed the restaurant in the 'special request box' that it was a treat for my partner's birthday and asked if there could be anything done to make it special, I had been told by my sister that her boyfriend got a free cocktail and a song from the staff on his birthday, I had also told the manager who seated us upon our arrival that it was his birthday and he got no such special treatment, I did not want to make a fuss about it so I didn't press it at the time. Regardless we had a great time and staff were otherwise very accommodating. Left very full and satisfied and would definitely visit again. Already recommended, had a lovely meal for my husband's 87th birthday and he loved his surprise cocktail. Will be back again as only 20 minutes from home, really fantastic friendly staff and excellent food. Absolutely amazing food! Both the salad bar and the meats were stunning, staff were friendly and so hospitable! Lovely atmosphere and thoroughly enjoyed my evening, exceeded expectations! Visited on a Monday evening when the restaurant was reasonably quiet, this did not detract from our experience at all. The staff were very friendly, no pressure on us to eat quickly and ruin your appetite. The salad bar was varied and plentiful and the meats delicious. Will definitely be visiting again! We loved every minute of our dining experience.